I will be making some more traditional collars based on historical pictures, with my own twist of course. 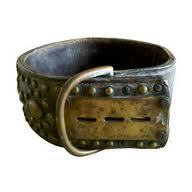 More traditional stud work with some cool brass buttons, and with a brass strap end to a pad lock, instead of a buckle. Not seen so much this day in age, but vastly used earlier in the century. I want to preserve some of these methods, tailored more for the mastiff, but other large breeds will look great in them. I will post a historical picture for viewing.